2018 - Storm - NUL POINTS! 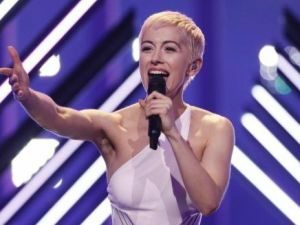 Susanna Marie Cork aka SuRie was born in Essex and as a versatile singer, songwriter, arranger and dancer had twice contributed to successful Belgian Eurovision efforts in both 2015 and 2017. A broadly similar approach to 2017 in term of the process, however the selection show was distinctly “Swedified”, as 2015 ESC contest winner Mans Zelmerlow was brought in a as a co-host with Mel, and indeed the whole event was staged in Brighton Dome, iconic setting of Abba’s 1974 win. Again no breakdown of the final vote was given other than the announcement of the winner. “Storm” was performed ninth of twenty-six, between hosts Portugal and Serbia. Infamously and shamefully a British political activist was able to invade the stage and interrupt SuRie mid song. After he had been removed SuRie was able to take up her mic and complete the song. The organizers offered the UK delegation the chance to perform again later in the show but this was declined. Result: 24th of 26 with 48 points. The jury vote was based on the Friday night show and “Storm” managed 23rd place with 23 points, it’s highest being an eight from Israel. Many thought that SuRie would benefit from sympathy votes in the televote after the stage invasion, however this was not to be, although she did manage 20th place with 25 points, the highest being a ten from Ireland. With 23rd and 20th Storm was a little unlucky to slip as low as 24th in the joint vote. Post Lisbon SuRie has regularly popped up at Pride events and also performed some intimate unplugged shows, while working behind the scene on her new project, a 2019 album. Another rather mediocre set of UK songs but on the night in Brighton SuRie performed the pants off “Storm” and it was no surprise when she was unveiled as winner. She graced many Eurovision events with charm and humour. Such a shame then that soon after the win the powers that be decided to revamp “Storm” in a re-arrangement that immediately stripped away it’s momentum. From that point on then the fate of the song was doomed and it must in all honesty rank as one of the drabbest UK entries of the period we’ve been looking at. On the other hand we have nothing but praise for Surie, from her enthusiasm in the good times to her bravery and stoicism at the worst of times on the Lisbon stage. A performer to make us proud. Just a shame about the song.